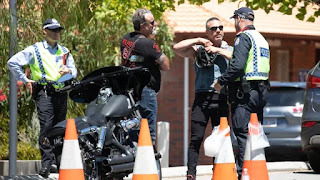 WA cops are out in force to ensure HA bikies don't cause trouble, with gang members from across Australia descending on Perth this weekend for a so-called “national run”. At least 40 members are expected to join locals at the club’s Hilton headquarters. The clubhouse is a former police station. The Hells Angels quietly established a presence in WA in late 2016 and are believed to have only about a dozen members locally. The State Government says it will introduce anti-consorting laws before July.